How to draw shoes that don't look weird! For the next part of our series on drawing feet, you’re going to learn how to draw shoes. On the right part of this example, you can see how a high-heeled shoe leaves an imprint in the ground. There is just a small point for the heel and then a flat area for the toes. 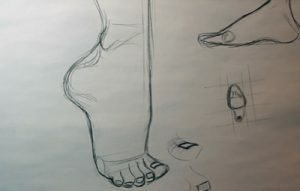 Keep this in mind when you are drawing a foot in a shoe, which parts of the shoe will actually be touching the ground, and how is the shoe interacting with the bottom of the foot? 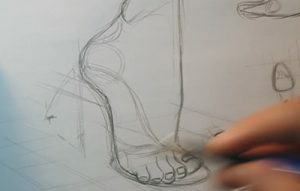 Going back to your earlier drawing of a foot on tip toe, you can add in the structure of the shoe behind the foot. Notice where the weight of the foot will rest on the heel. It is closer to the toes because of the position of the foot, than if it were resting in its normal position. As you start drawing and learning how to draw shoes, go back to the idea of the ‘shoe insert’ to get your basic shape and design of the shoe down. When the foot is in this tip toe position there are different angles at play. The toes themselves are parallel to the floor, but the top of the foot is perpendicular to it. The band on the shoe is a great detail in this drawing and helps you to display these different angles, right at the point where they change. You can see how the band bunches up in the middle as the foot rises up from the toes. Pay attention to the structure of the shoe that is drawn in this example. You can see the shoe going around behind the foot and the parts of shoe’s heel that are hidden from us. Another important detail is the shading of the heel under the foot. And you’re done! 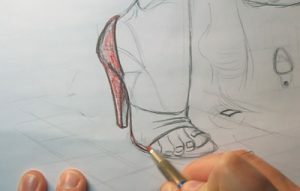 We hope you enjoyed this article on how to draw shoes. Why not let us know in the box below?